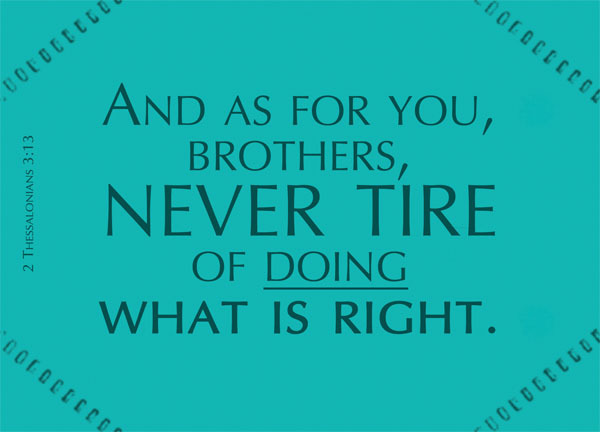 And as for you, brothers, never tire of doing what is right. The second epistle of Thessalonians was written to the Church of Thessalonica, which was established during Paul’s second missionary journey, with an arguably ominous beginning – having reasoned with and persuaded some of the Jews regarding the gospel of Christ, an uproar was caused in the city and Paul and Silas had to be sent out of the city secretly. This whole exciting if not dramatic account can be found recorded in brief in Acts 17:1-15. The city of Thessalonica was a large city, that prospered as a center of trade and commerce. From Paul’s two letters to them, it appeared that they had remained strong in their faith despite the persecution [2 Thes 1:3-4]. However, misunderstanding about the Lord’s coming had caused some members to be troubled [2 Thes 2:1-2], while others even stopped working and allowed their faith to dwindle perhaps in the assumption that, since the Lord was returning, they didn’t need to work anymore. Paul’s message in this short letter to them was clear – be steadfast in your faith and continue to do good even as you await for the coming of Christ. And as for you, brothers – who were the brothers Paul was referring to? We know that this letter was written to the Church of Thessalonica in general, there could be plenty of brothers who will directly or indirectly, read his letter and receive his message. The word ‘and’ urges us to refer to the preceding verses – We hear that some among you are idle. They are not busy; they are busybodies. Such people we command and urge in the Lord Jesus Christ to settle down and earn the bread they eat [2 Thes 3:11-12]. In verse 6, Paul had already addressed the same people using the same term – In the name of the Lord Jesus Christ, we command you, brothers [2 Thes 3:6]. He goes on to talk about the people who are idle, and comes back to address the same brothers of verse 6. While some of them are idle, he’s mainly addressing those who are not. The rest of the members of the church,who were not busybodies and took care of themselves and their families, did not stumble others and perhaps were beneficial to others. never tire of doing what is right – there’s an age old Chinese saying that says it is difficult to be a good person. It is difficult not to tire of doing what is right or doing what is good, because it is difficult to persist in doing good, especially when facing persecution. Often, doing good will end up hurting yourself, costing you things, causing misunderstandings about you. Often, doing good will require sacrifices not only from yourself, but also from your family. Often, doing good will bear no result except the disdain and complaints from people whom you’ve aided. Often good works are not appreciated. It isn’t that hard to do something good once in a while – but doing something good once in a while doesn’t mean you are a good person. Biblically, that doesn’t make you a righteous person. That doesn’t make you a Christ-like person. The difficulty in doing good is not the good itself, but the persistance in face of immense persecution and sacrifices. In Galatians 6:9 [Article], Paul goes on to elaborate on why we should not tire in doing what is good – Let us not become weary in doing good, for at the proper time we will reap a harvest if we do not give up. Galatians 6:9 is a verse that, though similar to 2 Thessalonians 3:13, is well worthy of a full study of it alone some day else. Today, we just need to bear in mind that we’re aren’t asked to persist for the sake of persisting. Paul isn’t some pseudo-saint who delights in making us do the difficult for nothing. Christianity isn’t for naught. We aren’t made to suffer for nothing [Galatians 3:4|Article]. We aren’t made to persist for nothing. Bearing in mind that we persist in doing good for a reason – and that reason is the harvest that we are promised – let us return to the study of the concept of never tiring of doing what’s right. There’s a difference between doing what’s right and what’s good – but only in the perspective of men. What’s good for me may not always be the right thing to do, and what’s right for me may not always be a good thing. But in the Biblical realm, anything good comes from the Lord, because God is good. Anything that departs from him isn’t good. You may be doing the right thing, but if your motive isn’t in God, or for God, then God delights not in it, and hence it isn’t, biblically, a good thing. That’s how I perceive this anyway. You may not agree – I’m sure it’s highly contentious. In this study, I’m assuming that when Paul says never tire of doing what’s right in 2 Thes 3:13, or when he says let us not become weary in doing good in Galatians 6:9, his ‘right’ and ‘good’ refers to the same things – that is, the right thing to do according to the righteousness of the Lord; and the good thing to do in accordance to the good that comes from God. An action for the greater good of God’s Kingdom that does not goes against the righteousness of Christ. I personally think that, literally speaking, Paul asked too much of us. Never tire of doing what is right? That’s a lot to ask for. I cannot remember how many times I’ve found myself weary and lethargic to continue in certain good works. Perhaps I still lack the faith that is required to never grow weary of good works. Perhaps I lack the heart or the fuel of God’s words in order to never tire of doing what is right. In any case, tire I will, and tire you most likely will. It is human to tire. We are not God. Physically, emotionally, and even spiritually, it may be inevitable that we at times will tire. But I would like to think that what Paul meant wasn’t to ask us to become superhumans. I think all he meant, was that our hearts should remain steadfast in the Lord. Never tire of his word. Never run out of the intention to do what is good – even if you are physically unable to. Never lose heart [2 Cor 4:1]. If you lack the strength to do what is good, instead of giving up, go back to the base and refuel your energy – turn back to God and ask for more strength. Ask for more energy. Ask for more faith. Ask for a breakthrough. Perhaps I have grossly compromised Paul’s command in my comprehension. But the me today isn’t strong enough (yet) to be able to say that I will never tire of doing what is right. Man, even at the thought of the phrase ‘never tiring’, I feel lethargic and weak already. But I will never stop working to seek my personal growth into that a state where I will never tire of doing good works. Again and again, whenever I grow weary, I will return to the Lord and ask for greater strength and persistance. Even if my strength is lacking, I will always insist in my belief in God’s goodness, and the need for us to always do what is good and what is right. And I pray today for mercy on the day in which this belief of mine will waver and be tested. In order to never tire of doing what is right, we certainly need to first be able to discern what is right. If we don’t even have this discernment, it would be for naught even if we have the mental and physical strength and desire to never tire of doing what is right. There will be many verses that will allow us to explore the concept of right and righteousness; good and goodness in the Bible. As for today, let us just pray for strength, in order for us to, as much as humanly possible, never tire of doing what is right. we all grossly compromise the Word of God, but few of us ever think about it in those terms. i think a girl who loves romans 12 as much as you do doesn´t have too much to worry about… our strength comes from Christ, and if we haven´t lived that out as our own experience, we will miss Him altogether. i´m convinced that is one of the main functions of persecution in our lives. when we run from it we are really running from the God who wants to deliver us and show us how great and majestic He really is… i know you love john piper, i wonder if you´ve read his book Don´t Waste Your Life… it´s life changing. love you! You actually do know quite a bit about me; that’s amazing. I appreciate that you noted and remembered. My exposure to John Piper is actually only as far as the desiringgod app that I have on my iOS devices; which allows me to listen to his sermons on the go. I haven’t read any of his books, and honestly never intended to. But now I will read it; and I will let you know when I’m done. It may take months or even longer though! Thank you, for a lot of things. But above all, thank God for you. the Lord often uses your posts to help me, i´m learning too. i read them in my email and don´t always come to say i like something, but i always do. i´m truly amazed at your stamina and your thinking about God´s word. i wish i had done much more of it when i was younger. it´s really a gift you are giving your future self.